Guinness adorers are in for a treat with the launch of an exciting new book solely dedicated to the world's favourite beer brand. Published to coincide with its 250th Anniversary, Guinness® tells the fascinating story of this iconic brand - the people, the places, the much loved advertising and of course the science behind that perfect pint! 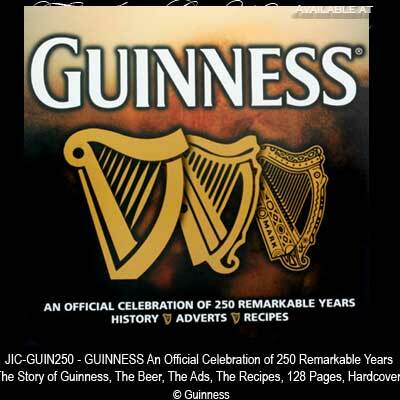 Added to this are also some scrumptious Guinness-inspired recipes making this stunning tribute book a must have for all true fans of the famous black stuff. From the beginning in 1759 when Arthur Guinness signed a 9,000-year lease on a run-down Dublin brewery, to the present when over 10 million glasses of Guinness beer are drunk every day, Guinness® explores the compelling history of the beer, through a series of evocative photographs of the people and places that are such a part of the brand's rich heritage. Here you can discover how a harp became synonymous with the brand and what happened when Guinness launched 150,000 bottles into the sea as a publicity exercise. Remembered too are some classic advertisements, with some special moments from early advertising work beautifully relived, including the famous Toucan bird. Plus discover what gives Guinness beer that distinctive colour and flavour and precisely how to pour the perfect pint. Added to this are also 18 delicious recipes, from a steak and Guinness burger to Honeycomb and Guinness ice cream that make the most of the unique taste of one of the world's best loved beers. Let's raise a glass to 250 remarkable years. Pork, Guinness, and potato pie - A good-looking dish featuring layers of meat, root vegetables, and sliced potatoes braised in herb-infused Guinness and served with sautéed apples. Ingredients: Vegetable oil, for oiling 2 large waxy potatoes, peeled and finely sliced. step 1: Lightly oil a rectangular baking dish about 4 inches deep - a large pâté dish is ideal. Place overlapping slices of potato around the sides and base of the dish to cover. With a very sharp knife, cut the tenderloin in half and then slice each half lengthwise as thinly as possible. Divide the slices into 3 batches and lay a third of the slices over the potato slices in the base. Cover the pork with onion rings and then long, thin strips of carrot. Season well with salt and pepper and sprinkle some of the herbs over the carrot strips. Repeat with 2 more layers of the potato slices, tenderloin slices, onion rings, and carrot strips, seasoning after each layer as before. Finish with a final layer of potato slices, which should bring the contents nearly to the top of the dish. step 2: Mix the Guinness with the stock and the mustard in a saucepan and warm gently. Season well with salt and pepper. Bring to a rolling boil and continue to boil until reduced by half and you have a thick, textured sauce. step 3: Pour the sauce over the pork and vegetables in the baking dish. Cover and bake in a preheated oven 350° F, for 45 minutes, then remove the lid and bake an additional 55 minutes until the top is well browned. step 4: Meanwhile, if making the topping, peel, core, and slice the apple. Melt the butter in a small skillet, and when it begins to bubble, slide in the apple slices. Sprinkle with the sugar and cinnamon and cook for about 1 minute on each side until just crisp. step 5: Serve the pie in hearty slices, topped with a row of the apple slices is desired. Step 1: Put the egg yolks and sugar in a large heatproof bowl set over a saucepan of simmering water, making sure that the base of the bowl doesn’t touch the water. Stir until the sugar has dissolved, then remove from the heat. Step 2: Heat the cream and Guinness in a nonstick saucepan to just below the boiling point – don’t worry if the mixture looks slightly curdled at this point. Pour over the egg yolk and sugar mixture, beating well with a balloon whisk. Step 3: Return the mixture to the nonstick pan and cook over the lowest possible heat, stirring constantly, until the custard starts to thicken and coats the back of the spoon. This will take at least 10 minutes and up to 20 minutes. Step 4: Pour the mixture back into the heatproof bowl and allow to cool completely, then stir in the chopped chocolate-covered honeycomb bars. Turn the ice cream into a shallow plastic container and freeze for 2 hours, then remove it from the freezer and stir well. Return to the freezer until completely frozen. Step 5: Remove the ice cream from the freezer and leave at room temperature for a few minutes to soften slightly before serving. Cheese on toast is everybody's favorite, and this version has a real bite! time, until you have the consistency of thick oatmeal. broiler. Spoon and then spread the cheese mixture over the untoasted sides. of mixed salad leaves or watercress. GUINNESS An Official Celebration of 250 Remarkable Years chronicles the remarkable history of Guinness. This hardcover Guinness book tells the interesting story about the beer along with ad campaigns and recipes in 128 pages with colorful illustrations.